If you or someone you know is prom-bound this spring, then you are in the right place. Men's Wearhouse is reaching out to teens to become a Prom Rep in exchange for discounts on tuxedos and some great prizes just for doing what comes naturally . . . communicate with others through texting and social media. "This year, Men’s Wearhouse is getting into the Prom spirit by offering teens a chance to text, tweet and talk their way to a free tux, $100 Visa Gift card, and even a Camaro Coupe when they participate in the Men’s Wearhouse Prom Rep campaign. The program offers deep discounts and free tuxes to students who sign up to be a prom rep and recruit other students to rent their tuxes from Men’s Wearhouse. 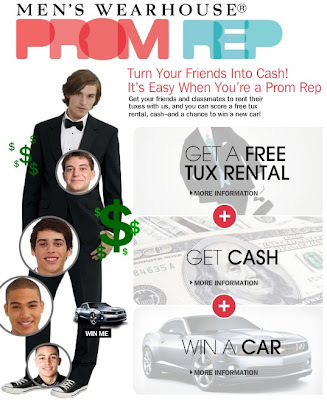 Reps who recruit ten friends to rent a tux from Men’s Wearhouse receive a free tux rental, and female prom reps who earn a free tux rental can give it to a friend or opt for a $100 Visa gift card." Although the prize was provided by Men’s Wearhouse, Men’s Wearhouse is not a sponsor or administrator of this giveaway. No compensation was received for sharing this information with my readers. One lucky reader will receive a $100 gift card to Men's Wearhouse. Leave a comment telling me which tuxedo style is your favorite. You MUST do this to be eligible to win this contest. 3) For 10 extra entries, blog about this contest linking back to this post AND MensWearhouse.com . Then come back here and leave TEN separate comments with the link to your blog post.